Capt. Dennis Tardio: You have an iron at home? Tony Benatatos: Actually I do not, sir. Capt. Dennis Tardio: You don't? Firefighter: Probie in a lot of trouble. Take two. Incredible documentary captured all the frenzied chaos and misery which loomed over NYC on that fateful morning of September 11th. 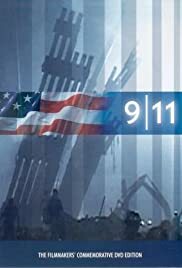 Intense, personal, and completely riveting, 9/11 is perhaps the greatest documentary ever made by accident, which kind of gives it an even greater appeal. Up until that morning, filmmakers Gideon and Jules Naudet had been following around a New York firefighter team, concentrating specifically on one new recruit in a little piece they were shooting dealing with the rigorous training to become a fireman. Out with the team that morning filming yet another simple routine cleanup, Jules lifts his camera up to the sky just in time to record one of the only known images of the first plane hitting the World Trade Center, and from there a simple documentary was no more. Viewers are given a first hand account of what it was like to be in and around ground zero, as the amazing group of fire-fighters and one profoundly bewildered cameraman attempt to navigate this disaster. Without hesitation, Naudet follows these automatically programmed heroes into the tower while it's entire support crumbles around them. The raw fear of an unknown, impending doom lurks with more viability then any fictional production could ever fathom as we watch less and less become audible and visible for those trapped inside. Nearly as memorable is older brother Gideon's candid capturing of an entire city in the throngs of a larger and more palpable fear then anything they had collectively witnessed. By the time we get to see the second tower collapse, as the cameraman shields himself from apocalyptic debris, we should all but be rinsing the dirt off ourselves from the amazingly up-close footage captured. Obviously the filmmakers deserve only as much credit as being in the right place at the right time to document such an extraordinary event, though one can only admire the two brothers in their extraordinary adaptation to such an event; in a few desperate minutes we witness them become like the firemen they document- only instead of saving lives they knew they had to save footage, even if it cost them their own safety. After viewing 9/11, and seeing that it came out in 2002, I feel much more resentment towards Oliver Stone's recent rendition, the big budgeted World Trade Center. Many had criticized the film for ignorantly narrowing down the focus to those two survivors trapped in rubble, and although I enjoyed the movie just fine for the small and sentimental Hollywood focus it brought, 9/11 all but renders his film completely obsolete. Not only will this utterly gripping footage remain the only definitive collection from that day, but the sublime transfer of motives midway ensures that this documentary has all the heart and character needed to never sensationalize the event again.